The Tony Award-winning A Man for All Seasons Returns to New York! 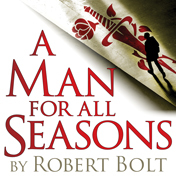 Fellowship for Performing Arts, producers of Shadowlands, The Screwtape Letters and Martin Luther on Trial returns to Theatre Row with Robert Bolt's A Man for All Seasons. The Tony Award-winning play brings to life the story of Sir Thomas More, Chancellor of England, and his refusal to support King Henry VIII’s divorce and England’s subsequent break from the church in Rome — a stand that would cost More his life. Full of wit and Game of Thrones-like intrigue this timely play about the risk of speaking truth to power is more relevant today than ever. Directed by Christa Scott-Reed.